Since the majority of Indigenous Americans did not have writing before the 16th century, oral history, songs, dances, and visual art record precontact philosophies, history, and worldviews. In Mesoamerica, writing dates back 3,000 years, beginning with the Olmecs. Mayan, Mixtec, and Aztec peoples created vast libraries of books; however, many of these were burned by Spanish invaders. From the surviving manuscripts, or codices, we can glean a little of early Mesoamerican thought, including their views about art. Below are some excerpts from Nahuatl poetry recorded after Spanish contact. I shall leave my song-image on earth (Brotherston 160). Toltecayootl a ycaya ninemiz ye nicã ayyo. Ac ya nechcuiliz ac ye nohuan oyaz onicas a anniihcuihuana ayayyan cuica-nitl y yehetl y noxochiuh nõcuicayhuitequi on teixpã ayyo. Hueyn tetl nictequin Tomahuac quahuitl nic ycuiloa yã cuicatl ytech aya oncan no mitoz in quemanõ in can niyaz nocuicamachio nicyacauhtiaz in tlpc (Bierhorst 220). The Cantares Mexicanos is a collection of lyrical poetry from the courts of the Triple Alliance (Aztec). The manuscript is in the collection of the Biblioteca Nacional de México in Mexico City. 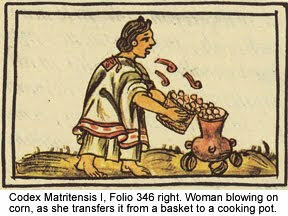 Approximately one and a half million people speak Nahuatl today. The artist: disciple, abundant, multiple, restless. maintains dialogue with his heart, meets things with his mind. works like a true Toltec, composes his objects, works dexterously, invents; arranges material, adorns them, makes them adjust. makes things opaque, brushes across the surface of the face of things, works without care, defrauds people, is a thief. Bierhorst, John. Cantares Mexicanos: Songs of the Aztecs. Stanford, California: Stanford University Press, 1985. Brotherston, Gordon. Book of the Fourth World: Reading the Native Americas through their Literature. Cambridge, UK: University of Cambridge, 1992. Inman, Mason. “Oldest Writing in New World Discovered, Scientists Say.” National Geographic News. 14 September 2006. Web. Portilla, Miguel León. Native Mesoamerican Spirituality, Ancient Myths, Discourses, Stories, Doctrines, Hymns, Poems from the Aztec, Yucatec, Quiche-Maya and Other Sacred Traditions. Mahwah, NJ: Paulist Press, 1980. What was the material the codices were on? Early Maya, Mixtec, and Nahua codices were on amatl (also spelled amate) paper, made from fig bark and coated with lime. Post-contact codices were also on parchment (fine lambskin or other delicately processed hides). Amatl is enjoying great popularity today as an art support in Mexico.